Who says you can’t teach an established craft brewery with a matured brand new market tricks? While last year saw a glut of craft breweries selling out to Big Beer, commercial craft juggernaut Oskar Blues hit the marketing gym with a vengeance to beef up by 30 percent in year-over-year sales, reaching 192,000 barrels (bbls) produced. Looks like the AB InBev, SABMiller Beer Voltron has met its match in terms of staggering feats of beer strength in Oskar Blues, which earns itself a new CBB nickname: Beer Beast Mode. Growth continues to be fueled at both East and West Oskar Blues breweries. The North Carolina brewery in Brevard brewed 90,000 bbls while Colorado contributed 102,000 bbls to the mix. Brevard is in the second phase of its 17,000-square foot expansion project that will take capacity over 200,000 bbls at that location. The Colorado brewery acquired an additional 60,000 square feet last year in Longmont and is increasing capacity and developing an Oak Aging event venue. Robust double-digit growth of Dale’s Pale Ale achieved 43 percent FY 2015 year-over-year growth in Total U.S. Food (Scans). The original craft beer in a can and flagship of Oskar Blues Brewery remains nearly 50 percent of the brand mix amongst strong new brands Pinner Throwback IPA and Oskar Blues IPA, which combined, make 18 percent of the total 2015 brand mix. Dale’s Pale Ale six-pack cans ended the year as the number one selling six-pack canned beer in U.S. grocery segments. The brewery expanded distribution to 45 U.S. states, parts of Canada, Sweden and the United Kingdom, with plans to reach all 50 states by mid-year 2016. Oskar Blues will open a third brewery in Austin, Texas, that will include live music venue in April 2016. 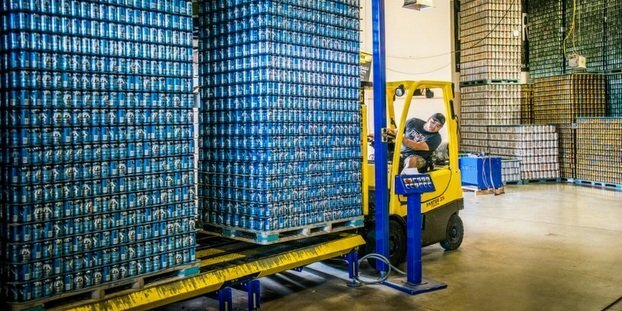 Crowler (CAN + growler), the newest innovation coming from Oskar Blues and its development partner Ball Corp., grew 1,000 percent, selling nearly 400 All-American Can Co. seamers and over 1.3M cans in 2015. A Crowler (CAN + growler) is a 32-ounce can filled with fresh draft beer from the source in a portable growler-sized can. Oskar Blues’ “B. Stiff & Sons Old Fashioned Soda Pop” grew 56 percent in 2015 on distribution increases of Root Beer in Colorado. The brewery announced expanded flavors including Ginger Beer, Black Cherry and Orange Cream along with distribution additions in North Carolina and South Carolina in 2016. The brewery also focused efforts on its do-goodery with several impactful initiatives carried out by its nonprofit arm, the CAN’d Aid Foundation. In 2015 alone, CAN’d Aid partnered with 52 organizations and provided nearly $400,000 in charitable contributions, bringing its doin’ good efforts to $1.3 million since its inception. Oskar Blues’ inspired brand extensions also thrived in 2015. The brand made its first foray into caffeine with the launch of Hotbox Roasters, which provides premium hand-roasted coffee in Colorado retail locations and via subscription service online. Its in-house, hand built, REEB Cycles bike company and full service bike shop at CyclHOPS Bike CANtina grew 46 percent over 2014. The restaurant profile will also expand in 2016 with the launch of an additional CHUBurger location and first brick and mortar Hotbox Roasters location both in the RiNo district of Colorado.